The Imprint was a short-lived but seminal journal devoted to the arts of printing, typography, illustration and lettering. It was published in between January and November 1913. The editors were the influential English typographic designers F. Ernest Jackson, Edward Johnston, J. H. Mason, and Gerard T. Meynell, who were assisted by an Advisory Committee of over 30 artists and individuals from the realms of art, printing and publishing that included Joseph Pennell, W.R. Lethaby, Douglas Cockerell, Arthur Waugh, F. Morley Fletcher, R.A. Austen-Leigh, and Sidney Colvin. 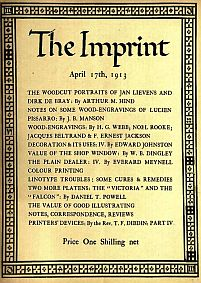 The Imprint contains articles on Poster Advertising on the London Underground; Children’s Book Illustration by Walter Crane; Decorative Lettering by Edward Johnston; Art and Workmanship by W.R. Lethaby; Current Trends in Illustration by Joseph Pennell; the Wood Engravings of Lucien Pissarro by J.B. Manson; Liturgical Books by Stanley Morison; the 1913 Arts and Crafts Exhibition by B. Newdigate; Post-Impressionism, with some personal recollections of Vincent Van Gogh and Paul Gauguin, by A.S. Hartrick; Honoré Daumier by Frank Rinder; the International Colour Printing and Poster Exhibition of 1913; etc.